This morning, Councilmember Jan Perry and I joined others in announcing that Los Angeles waterways are now protected with the installment of screen covers and inserts at more than 20,000 street gutter “catch basins.” These covers and inserts have already diverted more than 1,500 tons of trash from reaching the ocean and polluting Los Angeles waterways and beaches. 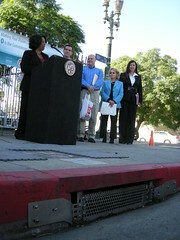 The street gutter catch basin covers and inserts were funded by Proposition O, the clean water bond that Los Angeles voters overwhelmingly approved in 2004. Trash or chemicals such as paint or oil dumped into storm drains end up in our waterways -- so don't dump them down there! If you're unsure how to dispose of any item safely, you can call 3-1-1 to ask for help.